The C & E subway stop on Spring and 6th Avenue. Bistrot Leo is the in-house caterer for private events booked in The Gordon Bar, the mezzanine lounge and on A60, the roof terrace bar. One of the best experiences I’ve had so far in New York. The place is beautiful and the staff was very friendly and fast. All the dishes for restaurant week felt very special, and the wine was delicious! Made reservation through Open Table, but BL never confirmed. Had to call them to find out if we're on. Looks like a beautiful restaurant but seated outside the dining room. Food was so-so, Restaurant Week desserts - creme brulee and chocolate cremoux were fantastic. Charged $20 for a glass of wine, third one was refrigerated. The following day the restaurant emailed to say that we cancelled a 10:30 a.m. reservation. I called to complain to a barely listening hostess. BL corrected mistake and got our points but will never come back. Loved the vibe, good service, but the food left a lot to be desired. Was with a party of 5 so I got to try a handful of dishes. The tartare and mille feuille were delicious, as was the cauliflower and the chicken, but the steak frites was average and the fagotini was sadly underwhelming (especially given the presentation). 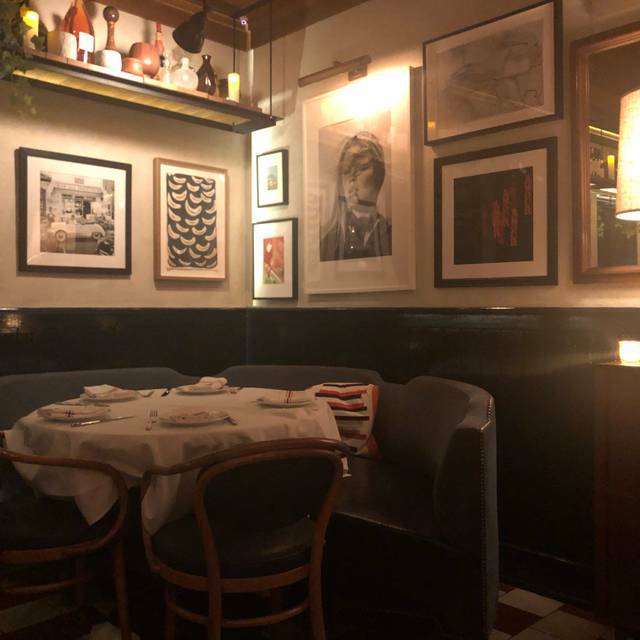 Great place to grab a drink and an appetizer, but plenty of superior French food at the same/a better price in the city. The food was very good. The service was atrocious. They have a area near the entrance where they seat all parties of 2, and then a main dining area down a hall from there. Most of the servers focused on the main dining room and ignored the front area. For example: our waitress gave us a wine menu and never returned to get our order, so we just asked someone else for our wine. We had to resort to flagging anyone walking by to get any service at all; the front area is not anyone’s priority. There are no tables for 2 in the back area, so a party of 2 will always be sat in the no service couples ghettto. We loved the food, but would never eat there again. 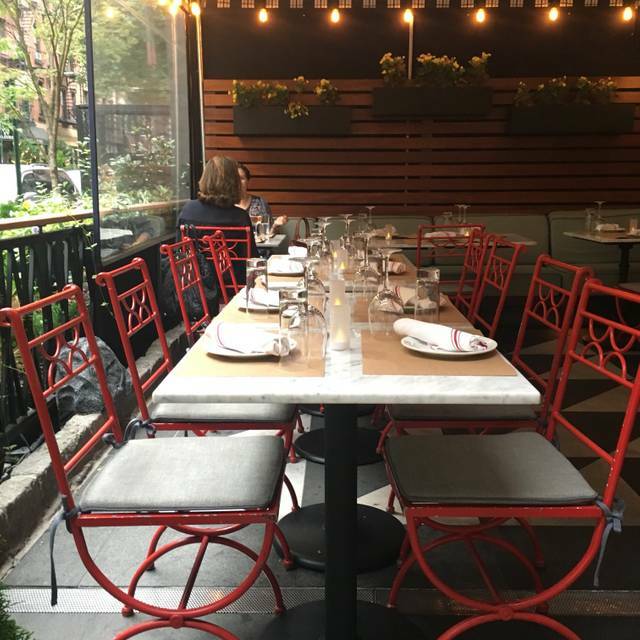 Wanted to find a nice Sunday brunch place to head to with friends, Bistrot Leo fit the bill, especially with their Restaurant Week deal going on. The mushroom soup of the day most of us choose was delicious, as was the steak frites, croque madames, and the mealball sandwich one of my friends chose. For the croque madame I had, it was the right amount of cheese to bread, and even salad to meal ratio portion to fill me for the rest of the day (if one wanted to eat sensibly). The steak frites said friends had were the right temperature too, and of course, delicious. The red wine that was suggested also paired well. Not too bitter, but also not overtly sweet either. It was just right! Separately we even picked up a small charcuterie order to share as we waited, and that too was pretty good. Would definitely bring in friends again for breakfast/brunch time (ideal to make reservations but not necessary as there was plenty of tables available). Overall, the food was mediocre. The mussel appetizer was more flavorful than our steak frites entree. It was dry for a medium and medium rare. Service was in attentive . No attention was given to us when we told them we we were done with our appetizer plates. They paid more attention to the tables next us with occasional follow ups. Took them at least 20 min to serve us our entree even though we were had occasionally tried getting attention. One good to at about to say about this place is the beautiful and cutesy decore styled here. Other than that I will not recommend this restaurant. Food was delicious! Restaurant week menu was very well put together. Courses were perfectly timed and service was good. Ambiance was very cozy and charming. Food tasted great but was not filling. Best Dover Sole this side of the Atlantic. Don’t miss the steak tartare. For dessert pain perdu is scrumptious! The hamburgers were fine, unfortunately everything else was disappointing. Great food and atmosphere. We definitely enjoyed the night. Impulse reservation - Sat night. Empty. The food here it was absolutely fantastic. I had the whole branzino which tasted like it was poached in butter. It was extraordinary! My only criticism is that they charge you four dollars for a few slices of baguette and butter. I can understand not wanting to waste bread in a day and age where people vilify and demonize every carbohydrate known to man. So just offer it upon asking. To charge four dollars for it is highway robbery. Great Service. Staff was very attentive. Food was great! Top notch service and excellent food. Fausto at the bar is the best! Cocktail maestro that we knew from his prior bar. Food was excellent and service from our waitress and the som top notch. Will be back! Food was very good but I think I coulda got more for my money. Service was excellent and the place itself was very nice. My creme brûlée was curdled. Thats not the end of the world, but it was a little disappointing. Starter and main dish (a salad and risotto) were good, but there are better French restaurants in town with better value and atmosphere. We ate brunch here, quiche, croque monsieur, french omelette, etc. Very classic preparations, with the omelette perfectly, slightly underdone, croque monsieur crisp and flavorful, and the quiche dense with flavor. We sat at the outdoor terrace on a drizzly morning, very peaceful and quiet. The restaurant is co-located with a hotel and near to, but a couple blocks off 6th Ave., thus it was a very quiet street. The Service and the hosting were very good, just nice people. Lunching outside on a beautiful day was very pleasant and relaxing. The food was more French Carib. than that of any particular french Provence. Bistro Leo is one of our stable of regular SoHo restaurants. We especially enjoy the steak frites which are usually cooked to perfection. This time, however, on a Sunday night, 4 out of 5 of us had to return them for being overdone. Unfortunately, the second round was not much better. We’ll chalk it up to going to a NYC restaurant on a Sunday night, but it was still disappointing. 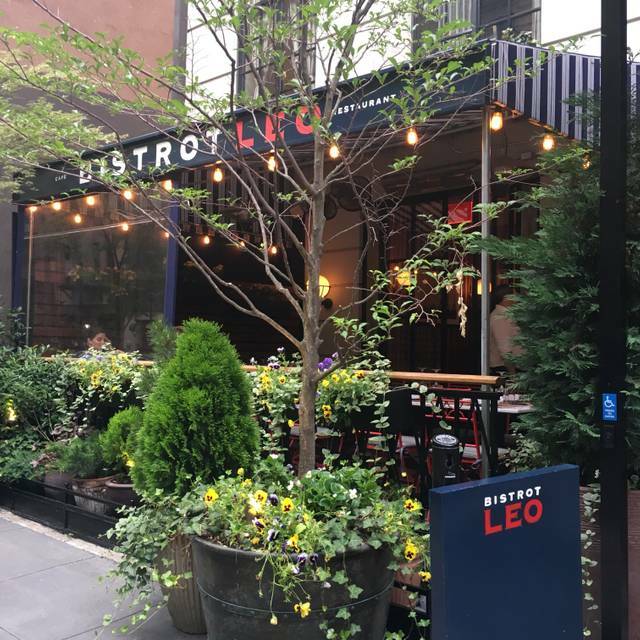 Bistrot Leo has a lovely setting in Soho with a pleasant outdoor dining area. It's a pretty place both inside and out. But the food was extremely disappointing: skimpy portions, failed recipes (for example the crème brulée). We thought the prices excessive. The food was excellent, the chef and his team are a talented bunch. Service was professional and courteous. All in all a very good experience and we will definitely return. Highly recommended. Ordered a side of bacon, came towards the end of my meal after I asked for it three times. No one cared to refill our waters.. we asked for some lemon wedges, the women who brought it literally yelled at us. Our coffee was just sub par. The eggs benedict was good but we couldnt enjoy it after all of this. Had a good experience the week before for breakfast but this week my experience was really really bad. Incredible food. The Salmon en papilotte was perfectly cooked and accompanying cherry tomatoes, quinoa and broccoli made a harmonious and balanced plate of heaven. The chocolate cremeaux is fantastic, with a deep richness of chocolate that is memorable. 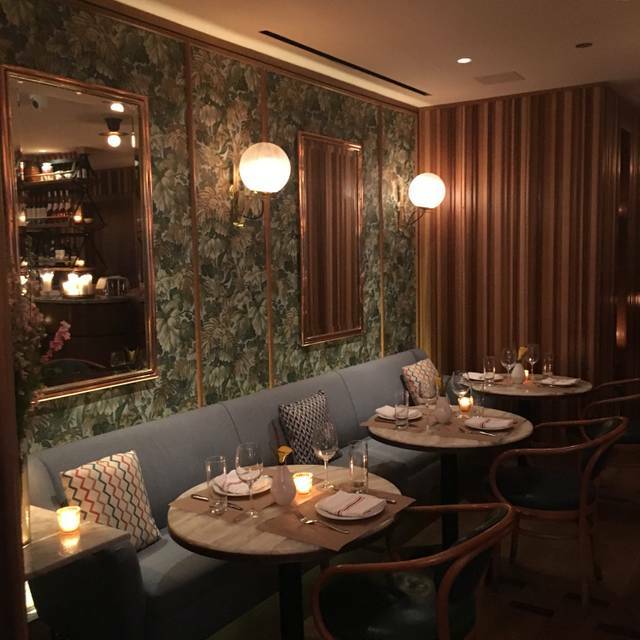 Service was excellent and ambiance special enough for romantic dining or a business meal. Truly enjoyed our time here! We really enjoyed our dining experience. Food was delicious. Tried several apps, salads and desserts. Loved all of them. The pork rillons, steak tartare and potato mille feuille were our top favorites. 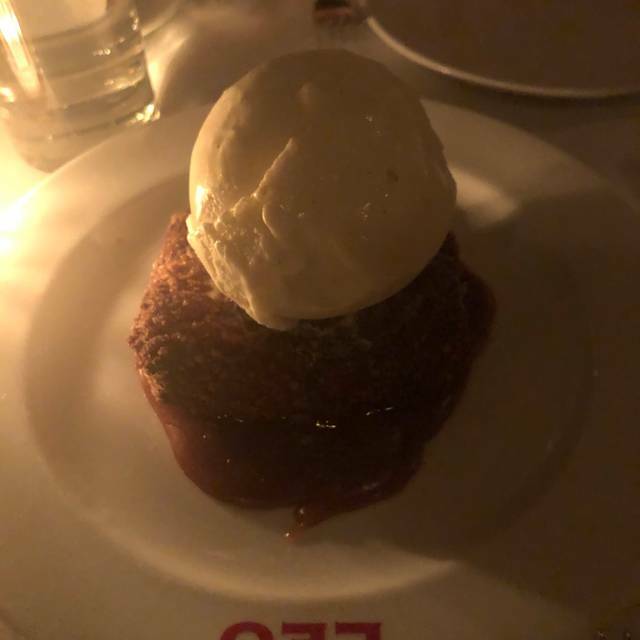 Don’t forget the desert... banana pan perdu was out of this world. Cocktails were also up to par. Would definitely return here again. I give this place a huge thumbs up. Perfect!!! Excellent food and our server was wonderful! We had dinner outside on the patio but can't wait to come back again and sit inside in the back - the decor is gorgeous. Food was perfect! Staff was friendly and helpful. The beginning was great to have a table outside. Drinks and waiter service were extremely sporadic and seemed as if we had been asking a favor to see when things would come to the table. The busboys were attentive. Place wasn’t crowded and waited an hour for entries. Host was trying to help but was clear the wait staff sitting around had focus on larger tables and others and overall a real disappointment. The place is really cool but clearly alot of issues for a new restaurant. Excellent new place. The GM and bartender were excellent. The Steak Tartare was outstanding. The Foie Gras had great flavor but a little too chilled. The Filet Au Poive would have been a 5 star for the sauce alone but unfortunately some of the peppercorns in the curst of the steak tasted burnt. The short rib was massive and delicious. NOTE: The DOH was there for an inspection which I am sure did not help matters in the kitchen (Ex: Foie Gras temp) but they still did an incredible job. Looking forward to a return trip. Thank you. We had a great meal! Decor was amazing! Outside seating was great!